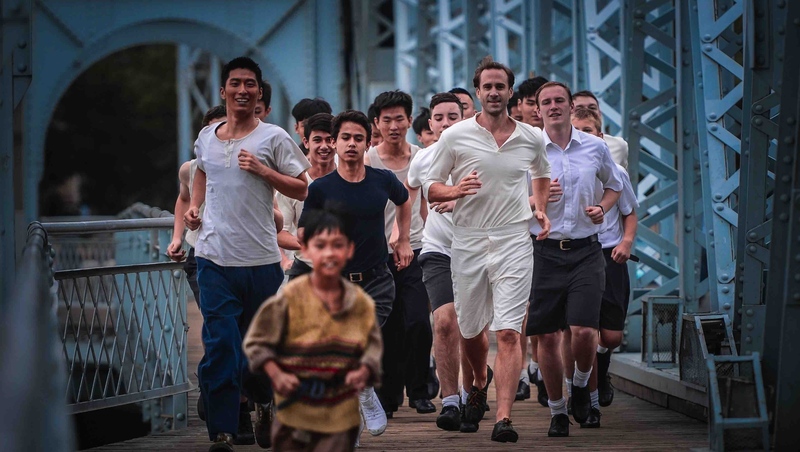 A new film about Eric Liddell is being released on November 3 in select theaters and online simultaneously. I'll be fielding questions after two of the screenings in NYC. Click here for more about my connection to Eric Liddell's story. In the year 2000 I started researching for Beyond the Chariots, my one-man play that tells the rest of the Chariots of Fire story from the perspective of Eric Liddell. My performance of the play at the Singapore Expo is now available: www.RichDrama.com/BtC. Since I first started my research at the Eric Liddell Centre in Edinburgh I've tracked no less than seven attempts (including one of my own) to tell more of Eric Liddell's story on the big screen, so I'm overjoyed that this one finally made it across the finish line... but being so tied to the story, I feel let down on certain fronts. Xu Niu is far left. Though I did submit for the role, I'm completely thrilled with Joseph Fiennes' portrayal of one of my lifelong heroes. He captured the good natured charm and indefatigable joy I've picked up in the biographies and interviews with more than a dozen people who remember Liddell. On Wings of Eagles is a total reworking of a film entitled The Last Race, which was released in Hong Kong and China last year. Producers Jim Green and Mark Bacino told me they took the raw footage and have reworked the storyline and introduced a narrator, the older voice of Xu Niu (played by Shawn Dou on screen and voiced by the older Bruce Locke). Though I haven't seen The Last Race, from descriptions I've heard I believe this is a much better film for Western audiences. Xu Niu is, from what I can tell, a fictionalized runner on Liddell's track team at the Tientsin Anglo-Chinese College. He follows Liddell throughout the story. 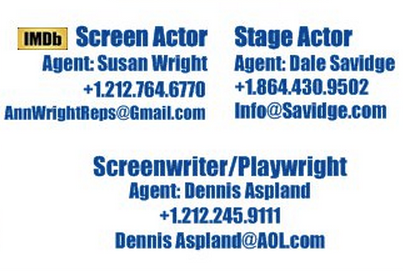 In my play I also have a fictional student of Liddell's in a pivotal role. I call him Mai Ker. An actual former student of Liddell, H. K. Cheng, saw a couple of my performances of the play in Hong Kong, and after one of those performances he was kind enough to do an interview, which we hope to release soon. I asked him if the fictional Mai Ker was similar to any of Liddell's actual students. He immediately thought of a classmate! As a young runner I was inspired by Eric Liddell the athlete. As a Christian I loved how Chariots of Fire showed Liddell refusing to run on a Sunday in the 100m, where he might have proven that he was the fastest man alive. Instead he trained for the 400m and broke the world record at that distance. One of the things I love most about On Wings of Eagles is that it shows Liddell turning away from fame and fortune that was promised after his Olympic success to minister to the people who nearly killed his family shortly after his birth during the Boxer Rebellion. Jacob Shams in his otherwise excellent review of the new film gets one thing wrong. He says, "...after his racing days were over, Liddell returned to the home of his birth, China..." Liddell's racing days were far from over! He broke the world record at the Paris Olympics when he was 22, and he left for China the very next year. I'll post more on Liddell's athletic accomplishments in China later, but the short version is that during a meet in China hosted by Japan for the Emperor's coronation, Liddell tied some of the winning times set in the 1928 Olympics earlier that year. Though the new film never shows Liddell running in his prime, there are two races, and in both Fiennes does a great job of showing him run beyond what his meager rations should allow. At one point we see him sharing his rations with children, which is a beautiful picture of who he was. At another point eggshells are being ground, and, indeed, they would add shells to meals to get every bit of protein they could. Doctors in the camp told Liddell they weren't eating enough for the youth to take place in athletics, but Liddell said without their bodies engaged, their souls would wither. 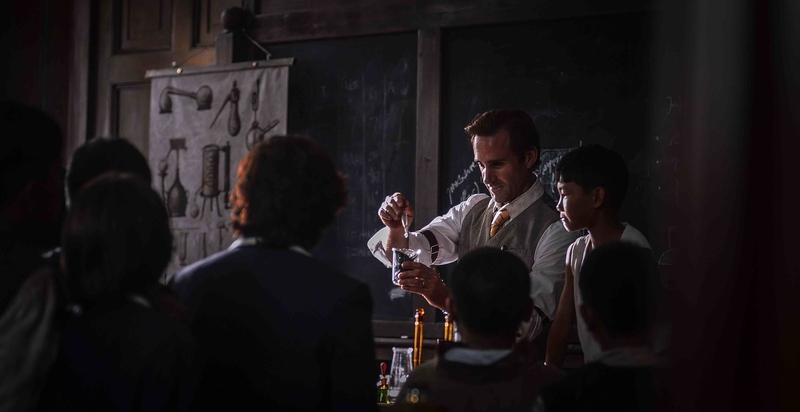 The new film is shot in China, in Tianjin (spelled Tientsin when the story takes place), where Liddell taught science (not English as Shams says in his review), and in Weifang (spelled Weihsien when the story takes place), in the actual compound where Eric Liddell and his fellow Allied prisoners spent the end of World War II. There are a couple of scenes summarizing Liddell's life as a teacher and missionary before it cuts to him on board a ship with his family before it disembarks, carrying his wife Flo and daughters Patricia and Heather to their family home in Toronto. Flo (Elizabeth Arends, who made no attempt at a Canadian accent) was also pregnant with Maureen, now Maureen Moore. After seeing one of my performances of Beyond the Chariots, she described that first trip as being in a cab with the windows rolled up. I was blessed to see the photo of Maureen as a baby take such a prominent place in the storyline, as Liddell was separated from his family during his final years. The farewell on the ship is a scene that may have been inspired by the Prologue in my favorite biography on Liddell, Pure Gold, by David McCasland, who saw my play and set up a tour of Tianjin for us. I'll post more on that later. In both the biography and the movie, it is quite a moving scene. It's not long (in the film and in reality) before Pearl Harbor is bombed and citizens of all Allied nations are put into internment camps. 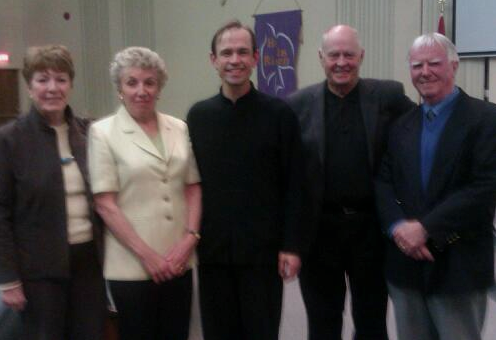 I performed my play for Jim "Jamey" Hudson Taylor III, the great grandson of the prominent missionary to China. Jamey, his three siblings and his grandfather were in the internment camp with "Uncle Eric," as all the students called him. After two of the three performances of my play Jamey saw in Hong Kong, he described how Uncle Eric was a father figure to so many children who were separated from their families. The new film captures this, in part with a sign Jamey Taylor mentioned to me. There were so many visits to Uncle Eric's flat that his roommate put up a sign indicating "Uncle Eric is IN" or "Uncle Eric is OUT." There's a moment in the film that a Japanese officer, Yoshinori Yumoto (played by Shigeo Kobayashi), interrupts a wedding ceremony that Uncle Eric is conducting. He takes the wedding rings from the couple. Though it's a fictional element of the story, it reminded me of how Jamey told me the Japanese put labels on people and things that read, "Property of the Japanese." The couple is separated when they're brought into the internment camp, but the new groom insists on married housing. Yoshinori Yumoto asks for proof that they are married, but of course he's taken their rings. Uncle Eric says, "What God has joined together let no man put asunder." Yoshinori Yumoto tells him, "My emperor is the god here." That much is in the trailer you can see below. It's Uncle Eric's response that is one of my favorite moments in the film on a number of different levels. I'm planning to talk about that after the NYC screenings. I love that there is an allusion in the new film to praying for their captors. Uncle Eric taught often on the Sermon on the Mount, and dedicates the better part of a chapter to it in his book The Disciplines of the Christian Life. In Olympic Hero in China, the documentary I helped create and for which I do the English narration, Stephen Metcalf, who was a young runner in the internment camp, said that one day Uncle Eric was teaching them the passage from the Sermon on the Mount that says, "Love your enemies and pray for those who persecute you...." Metcalf said that Uncle Eric said, "'Prayer changes the whole situation. When you hate somebody, you're self-centered. When you pray for someone you become God-centered.' And so he said, 'I've been getting up early and praying for the Japanese.' And he challenged us to pray for the Japanese." Metcalf took up the challenge, and after carrying Uncle Eric's coffin to the grave he said, "I promised God that if I came out alive, I would go to Japan as a missionary like Eric." Metcalf served as a missionary to Japan for 40 years. The Music Department of On Wings of Eagles had a high bar set for them since Vangelis won the Oscar for his soundtrack to Chariots of Fire. My brother and I listened to the record the night before every cross-country and track meet. The new film's orchestrator, Steve Greer, arranged for a live orchestra in Macedonia to perform the music, and I think they did a wonderful job. There were two songs in particular that brought joy to my heart. The first was "The Ninety and Nine." In Olympic Hero in China, Maureen tells the story beautifully of how, as a young boy, her father would always ask to sing that hymn about the story Jesus told of the shepherd leaving the 99 sheep to go after the one who is lost. Young Eric would always cry when the family sang it. Maureen said, "...it helped me to understand that even as a young child my father had a strong, strong desire to reach out and touch people with the message that they were all loved and they would all be safe and they could all come home." The second song that moved me was "Be Still My Soul." 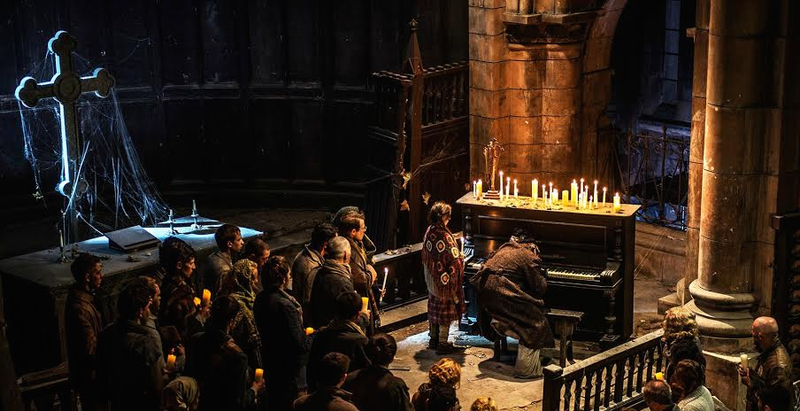 It was Uncle Eric's favorite hymn, and the new film introduces it early and it has a prominent place in the end. This brings me to my disappointments with the film. Whenever a story is taken out of history and told as a movie there must be choices to fictionalize certain elements in order to make it work in the format of cinema. Sometimes those choices upset those who know the real story well. After a performance of Beyond the Chariots in Milwaukee, an audience member Lucy Storch gave me two letters she received from Uncle Eric's sister, Jenny Somerville. She said, "The girl playing myself (Cheryl Campbell) was nothing like me! I was never against my brother running....The scriptwriter (Colin Welland, who won the Oscar for it) said you need a conflict in a film, so I was the conflict!" Though the use of "Be Still My Soul" at the end of On Wings of Eagles has its own artistic beauty, I missed the beauty of what actually happened. Uncle Eric's middle daughter, Heather Ingham, told me the family still has the slip of paper upon which her father wrote down the hymn's title while he lay dying in the internment camp's makeshift hospital. That slip of paper was delivered to someone in the Salvation Army band (alluded to in the film by a trumpet we see lying around in one scene). Prisoners were allowed to bring a few personal items into the camp, and band members had each brought their instrument. They played that hymn outside Uncle Eric's window on at least one of his final days. I'll post more about the Salvation Army band later. At a certain point in the new film, Xu Niu's subtitles indicate that he used the word hell as an expletive. I was sorry to see this because hell is a real place, and no matter how the cultural narrative downplays it, it is not temporary or benign. There is nothing in Scripture that indicates it is a lukewarm lake of fire. Though the use of the word was used to give shape to Xu Niu's character arc, I think it's a shame that the word was used in a film that should attract impressionable youths. Early on in the film we see Uncle Eric looking the other way when a bribe being given. Even if such a moment occurred, with only 90 minutes to flesh out his life, I think it was a very poor choice to show him benefiting from an illegal act without speaking against it. In another moment Uncle Eric is forced to run on a Sunday. It is true that he eventually decided to referee games on Sundays in the internment camp because, without his presence, fights were breaking out. But to hear the challenge without fleshing out the mental anguish that would have gone into such a choice is wrong. I hope audiences reflect on the fact that the stakes were much higher than the personal glory Uncle Eric walked away from at the Paris Olympics. My biggest problem with the film is a single sentence. Xu Niu describes "Uncle Eric's message: His faith in the essential goodness of mankind touched the edge of my mortal soul." After spending the entire film showing, often in very creative ways, that every good work Eric Liddell did was through the inspiration and by the power of his faith in the Lord Jesus Christ, this sentence reverses and undermines it all! As a Christian Uncle Eric most certainly did not have faith in the essential goodness of mankind. He believed, as all orthodox Christians do, in the fallen nature of mankind and our need for a Savior. At the moment that Xu Niu says, "Uncle Eric's message..." we're seeing a tight shot of the Cross. It is my prayer that viewers see the statement in the full Truth of that image: Uncle's Eric had faith that through the Cross we all have hope of goodness. As 1 Peter 2:24 says, "He (Jesus Christ) himself bore our sins in his body on the tree (the Cross), that we might die to sin and live to righteousness. By his wounds you have been healed." If people miss that, I pray they'll see the statement about Uncle Eric's message as an observation by someone on his way to seeing his need for a Savior. If you see your need for a Savior, you can reach out right now to the only One who bridges the gap between fallen humans and a Holy God: Jesus Christ. Visit www.RichDrama.com/MyPassion for more information. I'll speak and take questions after two NYC screenings of On Wings of Eagles on November 3 and 4 at Cinema Village, 22 E. 12th St., Manhattan. We're planning to record the Q/A session, so if you're outside the NYC area, post your questions in a comment below, and if there's time I'll answer questions that are posted here. * The word hell is used as an expletive. * "My G_d" and "da_ _it." -A young boy is blown up. -[SPOILER ALERT] Another young boy is electrocuted and it is said that he will stay on the hot wires for a week. A real electrocution in the camp probably inspired this fictional element. See the trailer below, or if you're reading this in an email visit www.RichDrama.com/OnWingsOfEagles. See the rest of Olympic champion Eric Liddell's Chariots of Fire story by watching it online or booking a live performance of Beyond the Chariots. I did an interview about this film on CHINAmerica Radio. Wow - this looks powerful!